During September 1963 a new 30 second commercial appeared in the London television areas, featuring an 11 inch vinyl doll in denim Jeans and a striped matelot sweatshirt of red, white and blue. She had the girl next door look with rosebud mouth, large blue eyes and a casual ‘wash and go’ hairstyle of bouncy curls, available in blonde, auburn or brunette. Along with a red Alice band and white lace up sneakers. How could she fail to impress? 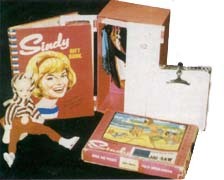 Market research proved that the most popular name for girls at the time, was Sindy. Now all that remained was to sell the doll to retailers. Lines Bros. (Pedigree) of Merton, London, decided to use a catchy jingle to launch ‘Sindy the doll you’ll love to dress‘ – four verses went on sell the first eight outfits and separates, her little dog Ringo and the song of Sindy played on her own gramophone. Seen as just another teenage doll retails were reluctant to stock the ‘Weekender’ clad beauty. Armed with green Ford Anglia vans, Pedigree salesmen travelled with promotional letters and a gramophone to introduce Sindy. 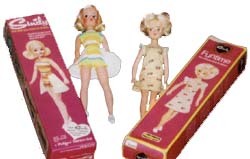 An introductory package of nine Sindy dolls, in various hair colours and a selection 48 outfit packs were offered, (a mix of both outfits and separates). Along with a free stand, with a flag bearing Sindy’s name and free Sindy Bazaar leaflets. Available for £19/1/9d plus purchase tax. 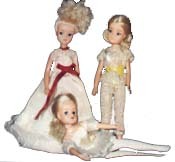 Hair stitches, with attached alice bands, prowded hours of fun, as Sindy could have bunches, plaits, pageboy and many other hair styles, depending on the outfit she was wearing. These were available in blonde, auburn or brunette. Footwear also changed with the times. Kitten heels, sandals, knee high and ankle boots, trainers and sneakers, slippers, court shoes and finally slingbacks available in assorted colours. Furniture was also provided and each year the range available became more and more el aborate. Starting with beds and wardrobes, eventually there were houses, horses and horseboxes, a four poster bed, beauty salons, caravans a green house and her very own television studio.